Mountain biking is permitted on all state forest roads and trails unless posted closed, with the exception of Richard J. Dorer Memorial Hardwood State forest, where mountain bikes are permitted only on designated trails. State forest roads can range from asphalt to gravel, maintained to minimal maintenance road surfaces. Some roads and trails may cross wetlands that will limit mountain bike use. Most state forests are made up of a combination of state, county, federally and privately owned lands, but are not signed or identified as such in the field. County and federal lands have their own rules for use. You must have the landowner's permission to enter privately owned land, and trespass laws apply. 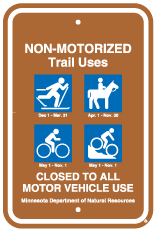 Many grant-in-aid snowmobile trails (identified by signs) cross private lands and are closed to mountain bikes and other summer use. Forest roads are used by cars, logging trucks, and other forest users (hikers, hunters, horseback riders, ATVs, and off-highway motorcycles). All laws for public road use must be followed on state forest roads. Watch out for logging trucks and heavy equipment in a state forest. Check the state forest's map and web page for road and trail closures. Mountain bike events require a special event permit from the area forester. To order a state forest map, contact the DNR Information Center.